It's an excellent, brand-new year-one Wii U game. It's simultaneously safe for kids and yet more or less Lego Grand Theft Auto—with you as a cop rather than a crook. It's the best Lego game of the 10 I've played, though it's not going to win any awards for progressive game design. And it's got Nintendo Easter eggs. 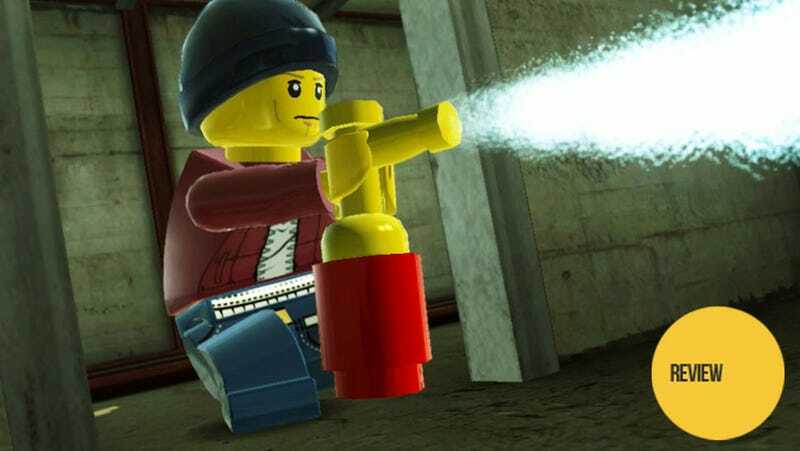 Lego City Undercover is the pitcher of lemonade that's been set up to greet those of us who have staggered through the desert of these early months of Wii U ownership. Can you believe we survived these past four months? Finally, a new game for the system. At last, the first Nintendo-published game on the system since November's launch-day releases of Nintendo Land and New Super Mario Bros. U. As you might find with that proverbial pitcher of lemonade, there's actually more here than you might want to gulp. It's overly sweet, too. These are minor concerns for the parched gamer, but a warning nonetheless: to break the metaphor, the game is a bit easy, holds your hand too much of the time and is written more for kids than for the adults who might be tempted to smirk along. Lego City Undercover is indeed as much an open world as a Grand Theft Auto, Assassin's Creed or Saint's Row. With Lego Batman 2 and Lego Lord of the Rings, the main series of Lego games were already moving toward this design: a massive plot of interactive terrain for players to explore, pocked with portals to storyline missions. The Lego City Undercover world is an attractive, enjoyable 17-region map of cities, countryside, prison and rocket-launch-pad islands, riffs on Manhattan, Miami, San Francisco and other places, all networked by roads, bridges, train lines, ferry stations and more. Some of it is rendered in a pseudo-realistic style, but much of it is rendered in Lego brick. Pedestrians are little Lego people. The game's hundreds of land, sea and air vehicles are all made of Lego. Many appear to be based on real Lego sets. Every one of them can be commandeered by the player. Every one of them, when bumped around during, say, a police chase, falls apart as a real Lego vehicle would. Usually, the roof falls off first. The glee you'll have simply being in Undercover's world is likely dependent on two things: if you 1) were ever a kid and 2) if you ever had Legos. If both are true then you, like me, may feel as if your toys have come to life—and if all the playsets you could ever imagine your parents spoiling you with are now one incredible county that you can run through at street level. Assassin's Creed might make the case for video games as historical tourism. Here we have the case for video games as the simulation of childhood fantasy. You play as a police officer named Chase McCain, and you will play alone. There is no traditional Lego series co-op here but, rather, one Wii U gamer and his/her GamePad controller, guiding Chase through his adventure. There's also no traditional character-swapping, no going from, say Lego Harry Potter to Lego Hermione Granger. Instead, you're technically always Chase but can swap through eight core character types: police officer, robber, miner, astronaut, farmer and a few others I won't spoil. Each have special abilities, some as soon as the persona is obtained, others unlocked as you play. Here's my Chase in his police, robber, miner and civilian garbs. Yes, as a criminal, I can shoot paint. So evil! WHY: It's essentially an all-ages Lego: Grand Theft Auto, which the world definitely needed. Type of game: Open-world policeman/farmer/robber/astronaut adventure through a Lego-ized version of New York City, San Francisco, Miami and a bunch of other places. What I played: Finished the game's main story and did lots of side stuff, for a meager 35.2% of the game cleared over the course of 21 hours, 50 minutes, 22 seconds. 16,839,870 Lego studs burning a hole in my pocket. 105/450 gold bricks obtained. 57/290 characters, 32/110 vehicles. The experience of driving through a world of Lego play-sets, like getting a permit to play through a childhood fantasy. The sense that there's always something new to discover. Minute-long loading times whenever returning to the open world. All the hand-holding that assumes I'm incapable of figuring out how to do something simply by -gasp- playing. "Proof that movie licenses are over-rated." You might notice that my Chase's cop persona looks like Sherlock Holmes. That's just one of a couple dozen police personas that I could have found and unlocked in the game, The same for the robber persona and the rest. You pick one as your main costume for each persona but can switch those choices at changing stations throughout the city. In fact, for the civilian garb, there appear to be about a 100 options, everything from Viking warriors to press photographers. There are an insane 290 characters/outfits to find in the game, plus 110 vehicles to unlock and then call in at drop-points that you can construct throughout the city. The costumes are silly and some of them, like the undercover-cop 70s leisure suit, unexpected. Much of the game's successful humor comes from dressing in these nutty outfits. The game's main creators, the studio TT Fusion, help by drawing some absurd animations for the characters. The default farmer's one of the best, as he pulls a chicken from under his straw hat and then uses the chicken as an egg-shooting gun. As with any open-world game, you'll have a choice with Undercover: play the main missions or do the side stuff. The main missions involve Chase trying to track down a master criminal who has busted out of prison, but include lengthy deviations into such odd activities as training to be a fireman or stealing a T-Rex skeleton from a museum. Technically, there are 15 story missions—the type familiar to players of the series who understand what collecting red and gold bricks and maxing out a Lego studs total—are all about. But other missions within the open world connect those episodes. If you've played GTA, you'll feel at home in these, as you will have to commandeer a truck and outrace some motorcycles from one edge of the map to another or as you'll have to fend off a bunch of thugs who surround you on a rooftop. The main story is made for my nephew more than it's made for me. The developers are making a silly cop show, but with the kind of police captain who often has a donut stuck to his face; your idiot police sidekick complains that the horse he is riding has a funny face—until he realizes he is riding it backwards. Some of the jokes work, but a lot of it feels juvenile and will be the toughest part of this game for grown-ups to swallow. Bonus jokes: there's a guy late in the game who is an Arnold Schwarzenegger soundalike. Almost every line he has is a Schwarzenegger movie pun. For example (and forgive me if I scrawled these down a little inaccurately... these are close to verbatim): "That gate needs repairing. Did you not hear it jingle all the way?" "Don't you understand a simple command? Oh? No reply?" "Stop walking, man. Start running, man." That more dynamic gameplay moves the series in the right direction, as does the overall setting. Gone are the crutches of a familiar movie license like Star Wars or Indiana Jones. And in its place we have a celebration of something that feels more innocent and that feels more like a playground. If only there was more play possible. The game is forever telling you how to do everything. Pick up a key and an arrow will appear pointing you to the lock it goes in. Grab a stick of dynamite and you'll be directed toward the place where it's meant to blow something up. This is typical of the Lego games and symptomatic of the half of the Lego toy philosophy that these games embrace: whereas the non-Lego but very Lego-like game Minecraft is all about taking a pile of bricks and making anything out of it, these official Lego games are very much about following directions. In this series, pleasure is programmed to come from doing what's planned. You're expected to have fun by, essentially, making the thing that's on the box. It's disappointing that, even in the face of Minecraft's success—at its affirmation of the wonder of free-form block-building—these Lego games have found no way to deviate from a design that is about there being rules and there being consumers who must follow those rules. I can't lie, though. I can't deny that Lego City Undercover's essentially automated-Lego-building does look cool. They're pleasing to activate, once you've earned enough special bricks to trigger them. There are more than 60 of these so-called super-builds, of course. Because there's a lot of everything in the game. It's fun to romp through this city, ignoring all the missions and simply seeing what there is to do. At every corner there's something to collect, some new ability to learn, some new pile of rocks to blow up, some new stack of things to build. There are treadmills to run on, sand castles to punch and as you do these things you might unlock a new character or see a number tally up that indicates that, oh, there must be three more sand castles to punch and punching all of them must unlock something. Simple rewards structure? Skinner Box? Relatively un-nutritious gameplay? Yes. But it's all...so...damn... cheerful. Your heart will have to be cold not to be won over even just a bit. As for this being a Nintendo exclusive, we've got the integration of the Wii U GamePad, which is used to display the vast game-world's map and as a set of x-ray specs that can be held up and rotated to scan through the world for secrets (a similar effect to what's been seen in the Wii U games ZombiU and Batman Arkham City, making it old-hat already). There are also little Nintendo-brand surprises. I cast a line off a dock and caught a Super Mario Bros fish. I drove past parade balloons that included a massive invincibility star. I found a green warp-pipe. I've yet to discover any Mario or Zelda costumes, but I did find a bus called Epona. And... doesn't this truck look like Yoshi to you? This is a very good game to have on a four-month-old system. Some faults might be forgiven because of it. Or at least that's not why I'm going to hammer the developers too badly for making their open-world take over a minute to load every single time you have to return to it from a cutscene, story mission or visit inside police HQ. That's why I'm not freaking out that the draw distance is short and that vehicles often pop into existence on the road ahead. I learned to live with these things and have a good time. I would like them to fix whatever audio glitch kept me from hearing dialogue in the late-game cut-scenes, though! Year-one games for new systems tend to be more junk than joy, more rubble than castle. Anything decent is a defiance of expectations. Bugs and technical shortcomings aside, we're well beyond decent here. What TT Fusion and Nintendo have built here, happily, is something towering, sprawling and good. It's charming and cheerful. It's not mentally taxing, but it's great popcorn. Add this to the short list of Wii U must-haves, next to ZombiU, Nintendo Land and Little Inferno.